← Who Were the Whigs? 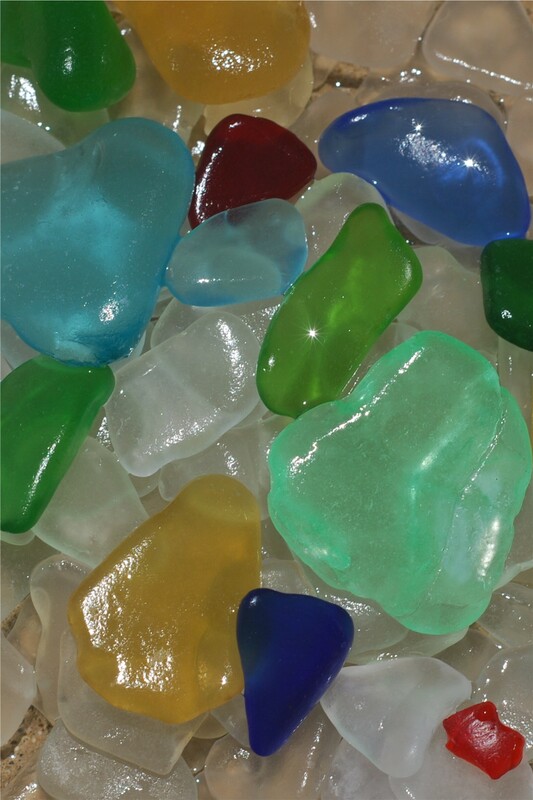 In case you haven’t heard of it, sea glass is broken pieces of glass that have been bounced around by the waves until the sand has buffed them smooth and jewel-like (see photo). Green, white and brown seem to be the most common bits, and it’s not difficult to imagine that those shards were once part of beer bottles or windshields. We have found pale shades of blue that look like they were from a Bombay Sapphire gin bottle, and darker blues that we assume may have once contained Vicks VapoRub or Milk of Magnesia. Other colors, like amber or yellow, turn up occasionally. Red sea glass sets off an impromptu celebration on the beach when it is found because it is so rare. Presumably, red pieces were originally car tail lights, or nautical running lights. So what does one do with sea glass? Some artisans make jewelry out of it, and others make “stained glass” art objects. My running joke is that I intend to make a mosaic replica of Leonardo da Vinci’s “Last Supper” out of sea glass. “Oh, this will be perfect for Peter’s robe,” I’ll say when I find a little nugget. My wife smiles tolerantly since that is the 497th time she has heard some version of that same joke. Mostly sea glass collecting is a hobby, in the same way that other people collect antique mousetraps or sock puppets. For all I know there are probably organizations formed by those hobbyists, just as there is a North American Sea Glass Association. Incidentally, we are not members of that organization; we haven’t gotten to that level of sea glass commitment. We’re content to just pick it up when we happen to see it, and appreciate the beauty that has developed from something that used to be trash. Sally once remarked that the same principle that makes sea glass so attractive may apply to people, too: sometimes life has to toss us around a little to smooth out our rough edges. No, actually I think her point was that someone who has been cast aside by one person can be seen as valuable by someone else. Either way, she may be on to something, and here’s what I’m thinking… maybe if I get tumbled for another 10 years or so, I might win one of those giant $1,000 checks! This entry was posted in Uncategorized and tagged sea glass. Bookmark the permalink. You do a better job of storing and photographing your sea glass than I did when I lived in California. I remember as a kid thinking it looked better wet and storing my collection in a jar of water. Soon it was covered in a lovely green slime. I remember your collection. It was very pretty at first, but you were wise to throw it out when it started generating that toxic cloud. It’s amazing what nature can do with our waste. From rubbish to jewels, Just lovely.